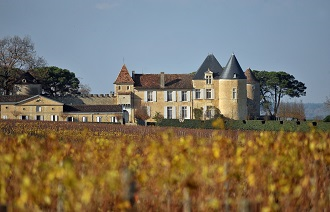 Getting back to the 15th century, a impressive manor house – more of a fortified farm than a château – overlooks the Sauternes countryside from a hill forty kilometers south of the city of Bordeaux. 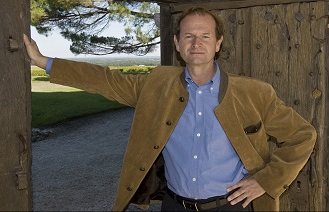 The wine, a miracle of nature, owes its exquisite quality not only to a unique terroir and the professionalism of the Yquem team in the vineyard and the cellar, but also to a microscopic fungus (Botrytis cinerea) found in the Sauternes region and especially at Yquem. In the autumn, morning mists give way to sunny afternoons. If accompanied by an easterly wind, conditions are just right to send pickers out to harvest the hundred hectares of vines, seeking only the finest Sémillon and Sauvignon Blanc grapes affected by “noble rot”, which concentrates both sweetness and flavour. During the harvest, grapes are presses as soon as they arrive at the cellar and the juice is immediately put into new oak barrels for fermentation. The wine is the aged in these same barrels for the next thirty months, during which it is regularly topped up and racked.